This post came to us from one of our Neighborhood Captains, Christine Ranegger, who was, at the time of its submission, visiting her homeland of Germany. 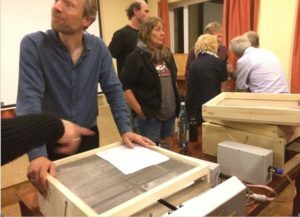 I am currently visiting my family in Germany and read a small announcement in the paper last Saturday about a presentation as part of the local Beekeepers association´s monthly meeting featuring the “Bee Sauna”… I was very intrigued by the name. The device is based on the fact that varroa mites have a lower heat tolerance than bees. The brood nest is slowly heated to 42°C and kept at that temperature for a time. This kills the varroa mites on the bees as well as most of the ones in capped brood. The entire process happens automatically once the program is started. A temperature probe in the top of the special lid measures the hive temperature and the heat elements in the bottom of the set up generate the heat and fans in the bottom unit move the warm air all through the hive. The treatment from start to finish takes up to 3 hours, depending on outside temperature and hive size. The hive is warmed up gently to give the bees time to move apart as the temperature rises. In preparation for the treatment it is recommended to remove excess honey and pollen stores, clean up big barriers of burr comb between the frames and to ensure the bees are not crowded by adding a temporary box with frames for the duration of the treatment to give the bees space to spread out (for large populations) and to remove one or two frames on the end to allow air circulation all through. The hive entrance is closed for the time of the treatment to prevent the bees from adjusting the internal temperature during treatment. A special “bottom box” is needed to accommodate the Bee Sauna device on the bottom. This box can be purchased or with purchase of a bee sauna come instructions on how to build the special bottom box. The recommendation is to have one of these boxes under each hive in an apiary to make treatment easy and quick. The bottom box allows for a solid or screen bottom board to be inserted when not treating. This product has only been available for a couple of months, so no long term results are available. No German bee institute had been interested in conducting long term studies so far. It’s a very sleek looking and interesting sounding device, but it comes with a price tag of 1300 Euro. I asked the gentleman presenting about converting to 110V, he was not aware of this being available at this time, but his job is marketing, not the technical details. Several options for powering are available: wall plug for apiaries near a home or power via a rechargeable battery (same battery as used by electric bikes). The company claims the treatment kills 70-95% of varroa mites, depending on the amount of brood. Developing mite nymphs in the brood are killed, but adult mites hiding in the back of brood cells, behind the larva are not always completely reached. The recommendation is to treat in fall or winter, during periods of little brood rearing. Two treatments per year are recommended. To prevent brood and egg die off the humidity in the hive is regulated by hooking a hose from a water bottle up to an opening in the front of the unit, this water is vaporized and pumped into the hive during treatment to prevent brood mortality. Since heat is much gentler and easier on the bees than acids, queen mortality and shortened life expectancy is not a problem. The unit can be connected to a computer via USB plug and data uploaded to help improve the program or to receive software updates. Time will tell if it’s all smoke and mirrors or really a new, revolutionary, and gentle method to treat against varroa mites. The device and idea seems to generate interest, the meeting was attended by 50-60 people. The person sitting next to me said this is a little above average attendance at a monthly meeting. Just like in Seattle, hobby beekeeping has been on the rise and interest in non-chemical treatment options is great here as well. The presenter was available for questions and the Bee Sauna could be handled and looked over after the formal part of the meeting. This link has a picture of the Bee Sauna set up with a hive.